The Team: You’re doomed. DOOMED! The core combo I really wanted to try was using Absorbing Man to enhance Poison Ivy and Parasite. 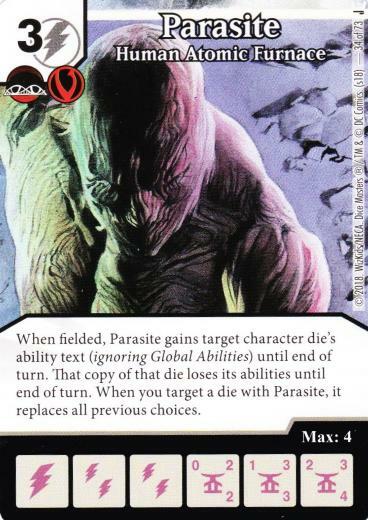 Both are very strong “When fielded” effects; with this combo, Parasite can take the text off two characters (something that doesn’t work with Shriek), though it’s just for one turn. And Ivy makes it so that you can just KO her and Parasite to bring them both back the following turn. 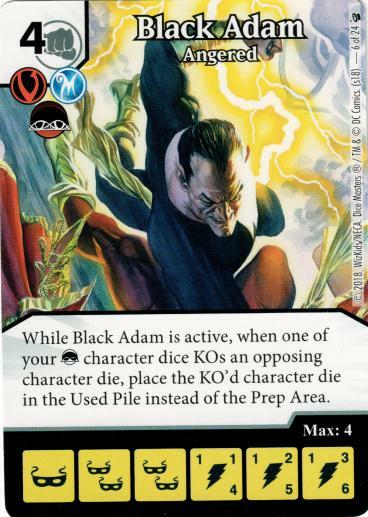 With two of my three core pieces being Legion of Doom characters, I took this as an opportunity to mess with some affiliation-specific cards: Black Adam and the Hall of Doom. Hall of Doom could be hilarious to bring in an Ivy to completely disrupt my opponent’s plan just before their turn. 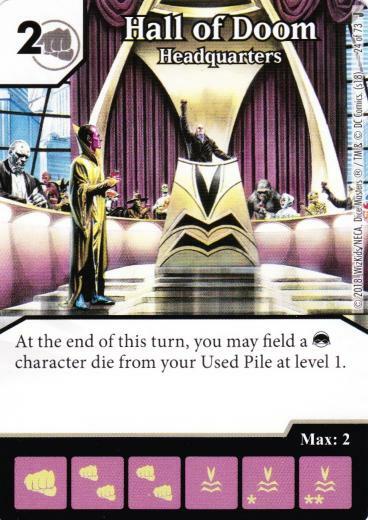 And Adam can make this disruption even worse by sending KO’d characters to the Used Pile. Black Manta is there because he’s the only 2-cost Legion of Doom character in Modern (other than Parasite, but I’m already using a different Parasite). He’s serviceable, and his ability works well with Ivy, but he was never going to be the star of this team. With Bizarro, Manta and Ivy all having defense-heavy stats, I decided to throw in Bizarro for the global. If I wipe my opponent’s board with Ivy, he can turn those defensive pieces into bruisers. As for the rest, Villainous Pact is there for a secondary win condition and his global gives me ramp and bag control. Kree Captain is there for his discount global (with me having 2-cost fist dice, I figured his global would be easier to afford). And finally, Power Almighty is a card I threw in as a potential ramp engine (especially with sidekicks, who can’t be spun up and thus always result in ramp). 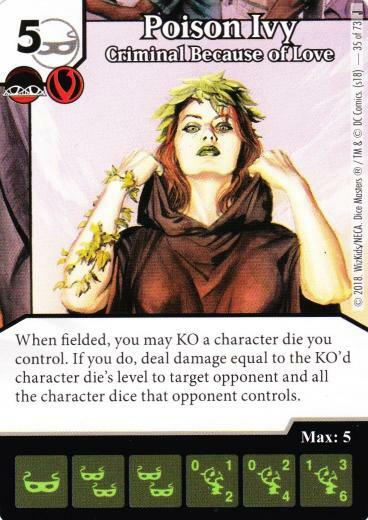 Plus, spinning my dice up works quite well with Ivy, who bases her damage on the KO’d character’s level. I started off my evening against a fun Clayface team. Yes, this guy actually relies on Clayface (not just the global) to run people over. He also had some Golden Age stuff mixed in (including old-school PXG, which is disgusting with Clayface). This was a weird one. He generally wanted a lean field (outside of Clayface), whereas I wanted to build up a wall of characters, use Ivy to remove blockers and charge in. He was one point of damage away from beating me on one turn. Right after, I got my Ivy + Absorbing Man combo to fire off, emptied his board, and swung in for the win (just barely). Remember my Stranger Danger team? Well, my opponent ran a similar build, except he also threw in C Boom Boom for additional damage and shenanigans (and he didn’t run I Want You, instead using the Stranger strictly as a deterrent against attacks). At some point, Power Almighty was my only purchasing option, so I went for it. Best decision I could’ve made. With 3-4 sidekicks active, I was rolling almost all of my bag every turn. This allowed me to set up my Ivy + Absorbing Man combo, and Parasite + Absorbing Man came in handy for once (I’d copy his Boom Boom and Zatanna, and deal him burn damage when I used his Thrown Brick and Power Almighty). I eventually managed to empty his field with Ivy and swing in for just enough damage for the win. He got me down to 4 life though, and was about to win the following turn. Won that one by the skin of my teeth. For my final match of the evening, I went up against a player who recently joined our group (this was my first time meeting him, actually!). He ran a Jimmy Olsen + Superman team (using the version with Strike), using the 2-cost Parasite to make his Superman even more crazy. He also had the same Ivy as me, but because I have Absorbing Man, he just didn’t use his Ivy all game. This was a weird one. He went for his quick, aggressive option, and I simply didn’t have enough defence on the board to stop him. Superman, buffed by Parasite, can easily get to 12-13A (with Overcrush of course!). I did manage to get my combo to fire off, but then I was left with too little characters on the field. When I was at 2 life, I took the gamble of setting up to beat him the following turn (hoping he wouldn’t roll enough characters to deal me the missing damage), but he rolled sidekicks aplenty and managed to win that way. Close one, and a well deserved win for him. -Poison Ivy and Absorbing Man are an excellent pair to use together. Doubling Ivy’s effect is incredibly useful, and when it fires off, it can be game-ending if you have enough characters active. -Parasite, on the other hand, was generally not worth having his effect doubled. Maybe it was just the matchups tonight, but him + Absorbing Man is only fully efficient when my opponent has two characters whose effects are worth stealing (see Game 2 for an example). Parasite on his own is still a fine card (but tough to use, since his effect only lasts one turn). 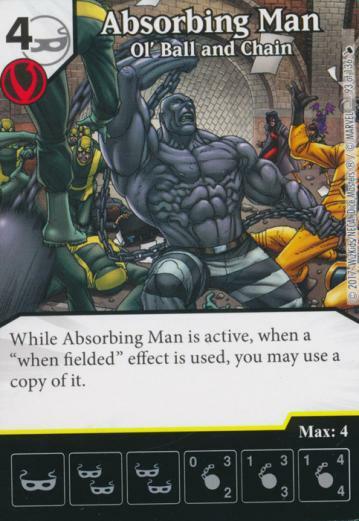 However, building around him + Absorbing Man seems to be unnecessary. I’ll admit this is a very limited sample size to come to this conclusion though. -Black Adam is unfortunately anti-synergistic with the Ivy + Absorbing Man combo (seeing as Absorbing Man himself isn’t Legion of Doom), so honestly, he was a clunker to include here. His ability was generally irrelevant. I should’ve gone for another character. -Hall of Doom did see some use here and there, but not enough to justify being on the team. My fielding costs were the biggest issue here; it was hard to field my characters and buy another one to bring in with Hall of Doom. -This brings me to the last issue I had: not enough 3-costs. I bought both my Parasite dice pretty much every game, due to a lack of better options. Scarecrow would’ve helped for sure. -A surprise hit for me, though, is Power Almighty. This is a deceptively fast ramp engine once it gets going. And what’s great is that you really only need one die of it (whereas it’s typically better to get 2 Investigation dice) to get that ramp going. Definitely one to revisit later. Overall, I liked the core combo of this team, but should’ve built better pieces around it. It worked out alright all things considered. There’s definitely lots more to mess around with when looking at the Legion of Doom (still want to do a Riddler build at some point), so don’t be surprised if you see more bad guys showing up in my builds for a bit.